Disturbed by the radical political views of Sheikh Mujib, the Ayub regime put him behind bars. A sedition case, known as agartala conspiracy case, was brought against him. It may be noted that during most of the period of the Ayub regime Mujib was in jail, first from 1958 to 1961 and then from 1966 to early 1969. During the second term in jail, Mujib's charisma grew so much that a mass uprising took place in his favour in early 1969 and Ayub administration was compelled to release him on 22 February 1969 unconditionally. Mujib's most uncompromising stand on the six-point programme led ZA Bhutto and Yahya's military junta to take a stringent view. Instead of allowing the Sheikh to form the government, the junta resolved to undo the results of the elections. President Yahya Khan cancelled unilaterally the National Assembly meet Dhaka scheduled to be held at on 3 March 1971. The announcement triggered off the death-knell of Pakistan. Mujib called an all-out non-cooperation movement in East Pakistan. The whole province supported the non-cooperation movement. During the course of non-cooperation (2-25 March 1971) the entire civil authorities in East Pakistan came under the control and directives of Sheikh Mujibur Rahman, himself becoming the de facto head of government of the province. 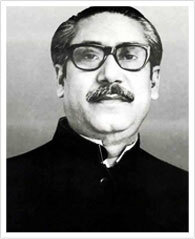 Although during the war of liberation was begun in the wake of the 25 March army crackdown Bangabandhu had been a prisoner in the hands of Pakistan, he was made, in absentia, the President of the provisional government, called the mujibnagar government, formed on 10 April 1971 by the people's representatives to head the Liberation War. He was also made the Supreme Commander of the Armed Forces. Throughout the period of the War of Liberation, Sheikh Mujib's charisma worked as the source of national unity and strength. After the liberation of Bangladesh on 16 December 1971 from Pakistani occupation, Sheikh Mujibur Rahman was released from Pakistan jail and via London he arrived in Dhaka on 10 January 1972.